Well, if you believe the pre-launch hype, the dedicated song and the pizzazz surrounding the NX model (which rather aptly sponsors ‘Drama on Four’), suggests Iain Robertson, it could be the new unstoppable force in the SUV scene. Seldom a fan of ‘stock photographs’ (as supplied by the motor industry to media outlets), there are some new cars, for which I have never felt that photographic imagery provides any benefits. They are usually the more avant-garde models. The latest Lexus NX falls into that classification for me. All jutting angles, with compromising shut-lines and conflicting shapes, the NX looked more ‘ugly duckling’ than thoroughbred urban off-roader, with every shot I viewed. Yet, after the test car arrived at Chez Robertson, I found my opinion softening somewhat, as I started to appreciate the stance of this latest example of Japanese premium branding. For a start, it is not a replacement for the RX line, even though it is easy to believe that it might be, with minimal advertising revenue being directed at the larger model. However, it does introduce us to a more forward-looking styling stance by Toyota’s luxury car division. In fact, there are elements of the NX that are quite shocking, yet, step back, take a more considered approach and the car literally comes alive. I would even venture to suggest that, unlike the Nissan Puke…sorry, Juke…the NX possesses a clarity of line and style that makes it exceedingly handsome and market-leading, which is a novelty itself in a vehicle sector where conservative conventionality predominates. While Toyota is a past-master of producing strangely curtailed design efforts, for which you can take the Urban-Cruiser as a prime example, the NX is actually Lexus’s first attempt to enter the compact SUV sector and it is a pretty darned good one, let me tell you. Away from the pearlescent white of the test car, I do believe that the NX presents a very colour-sensitive outline. I have seen an example in a very handsome pewter silver, which not only looked classy but it was visually striking too…far better than UN-surrender white. 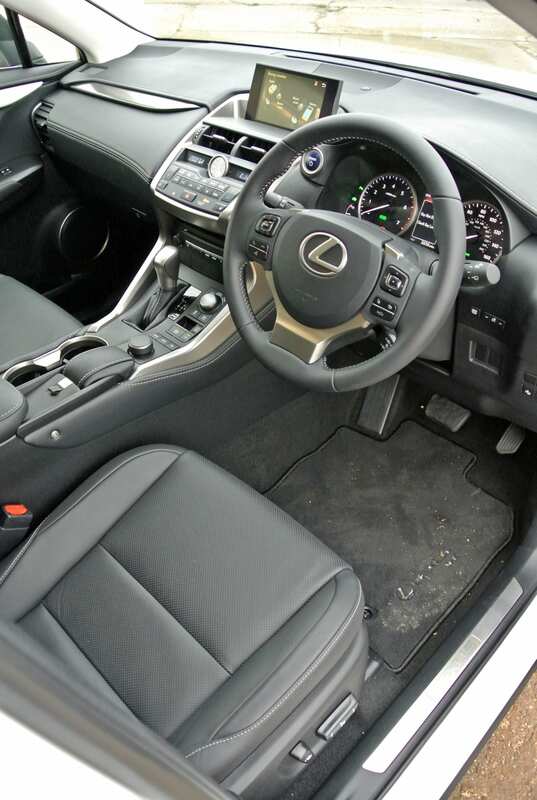 With shut-lines to shame Audi, entering the cabin reveals a host of Lexus niceties that are intended to impress and actually succeed at it. The ‘metal’ trim has the finish of an up-market camera, that sort of silky, silvered appearance that is not silver at all. Electrical adjustment of the driver’s seat enables a decent range of travel, to make obtaining a comfortable and commanding driving position possible. The same applies to the rake and reach of the hide-wrapped steering wheel. There is not a stitch out of place. Yet, just behind the palm-rest for the on-board computer controller, sits a small leather tab. I was intrigued to lift it, only to be surprised, when it removed completely, which I was not expecting, to reveal a little felt-lined storage box, which is perfect for keys but little else (for example, my smartphone would not fit at all). I wondered what to do with the little, leather-upholstered ‘flap’, knowing that, unsecured by a substantial hinge, or even a retainer of some description, it would be among the first items guaranteed not to appear on the second-hand car lot, at NX trade-in time! Rotating it revealed its sole purpose in life…it is a hand-held mirror; perfect for annoying zit-spotting, for checking spectacle alignment, or when applying ‘lippy’, which, I should add, is not something in which I indulge, unless attending a fancy dress party, as one of Cinder’s ugly sisters. 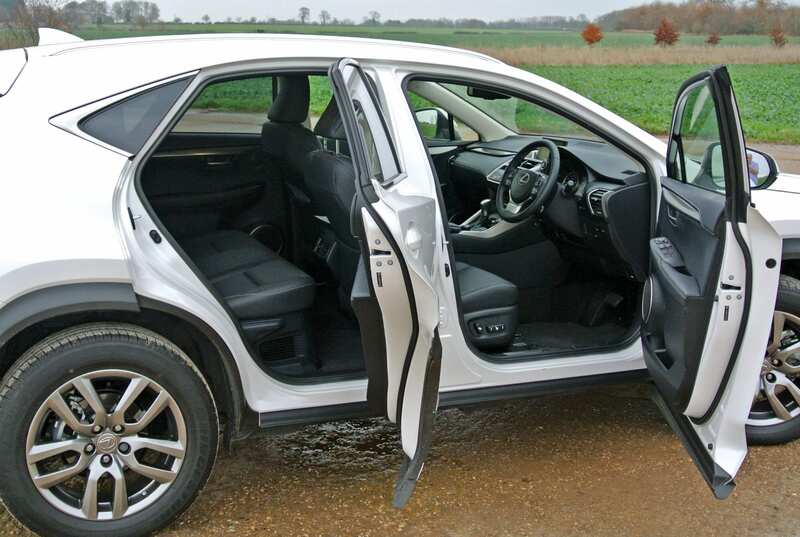 Thank the stars that it was the only utterly useless element of the otherwise intriguing Lexus NX…well, almost. There is an exquisite, high-end clarity to the leather-draped dashboard layout and its several controls. All of the switchgear possesses a machined-from-solid tactility and, while the electronic handbrake caused early confusion, familiarity soon bred and its application (and release) were less of a personal embarrassment. 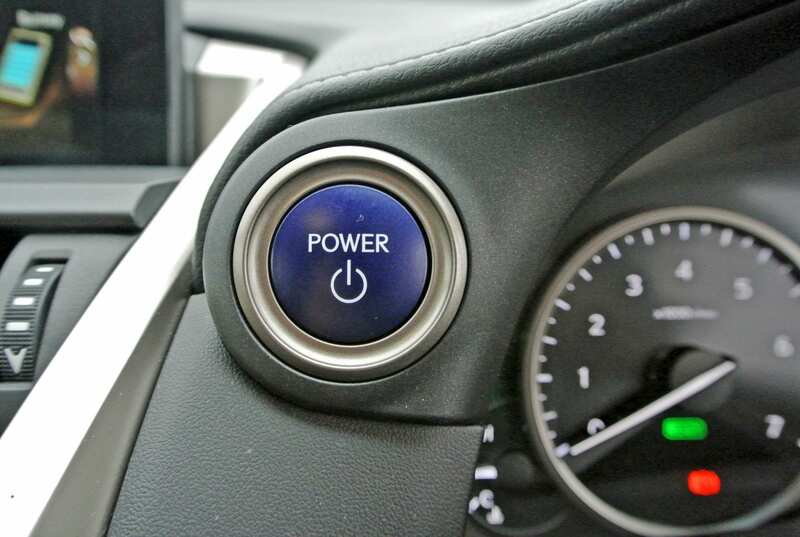 A neat Lexus analogue timepiece sits in the centre-dash, while the pushbutton, keyless start is located high-up on the top-left of the instrument binnacle, which means that the driver does not have to hunt for it, as in some cars thus equipped. The ten-speaker stereo system (sadly, not a Mark Levinson type, as fitted to top-end Lexuses) still delivers a fantastic sound and even the DAB radio delivered greater consistency of signal strength, i.e. not dropping-out in town, or in tree-lined areas, as it tends to do in many other cars, even my own. 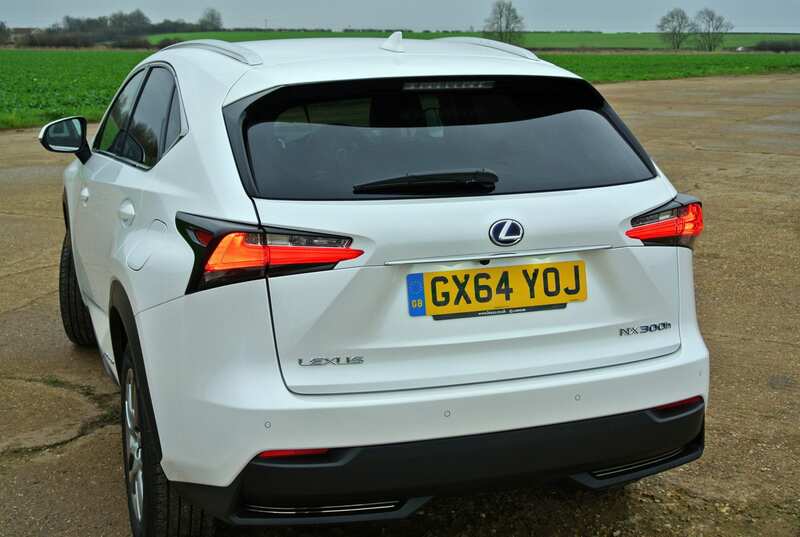 While I have not mentioned the model variant, as yet, in typical Lexus-speak, the NX300h as tested features the lower-case final letter denoting hybrid technology is at play beneath the car. A fairly conventional 2.5-litre, four-cylinder engine is mated to a 141bhp electric motor, to provide a potential total of 294bhp, or thereabouts. I should point out here that I am a thorough fan of hybrid technology, of which Toyota is a past-master. However, whether it is the constantly variable transmission (CVT), or the combination of the nickel metal-hydride battery pack and the on-demand 4WD hardware that causes ‘the lethargy’ in the NX’s power delivery, I do not know. What I do know is that the test car performed impeccably in town but was a flaming liability elsewhere. Its stated Official Combined guide figure is 54.3mpg, with the extra-urban figure given as 55.4mpg. However, I attained a satisfactory 46.5mpg around built-up areas, while the cross-country economy disappeared down a sluice, the NX guzzling the unleaded at a wholly unsatisfactory 28.6mpg. 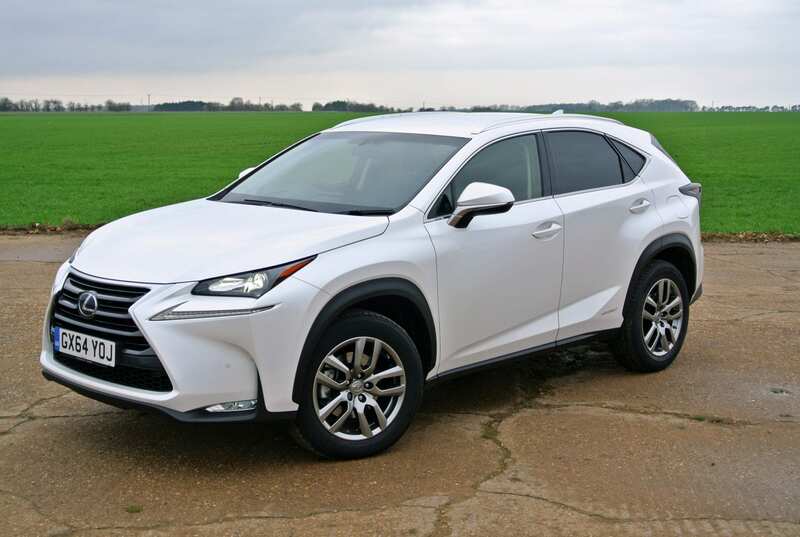 On the face of those returns, I would describe the Lexus NX300h as the perfect urban 4×4, which is not the point, at all. Factor in a top speed of 112mph, a 0-60mph time of 8.9 seconds and a CO2 figure of 121g/km and role of this hybrid starts to look as awkward as that of the Lexus CT200h, with its otherwise excellent Prius underpinnings. Its handling is very good and it retains a high degree of directional stability at higher cruising speeds. The ride comfort can a tad knobbly on some road surfaces but, otherwise, it is well controlled and largely roll-free. The brakes are strong, as they tend to be on cars operating brake energy recovery systems (which recharge the on-board battery pack). In fact, the overall driveability of the NX is practically faultless, plus it is quiet, refined (especially so, in EV mode) and imparts a feel-good luxury factor, as it should, for its £36,630 price tag (enhanced by the £645 paint job, the £495 Convenience Pack and the £995 sat-nav options, over the standard list price of £34,495). Ignoring the 4×4 system (with its extra electric motor), which is really present for added safety, as opposed to genuine off-road capability, intelligent as it is, I am not really a fan of CVTs. I have never quite come to terms with their need to rev the engine, until the wheel speeds match accelerative intentions. Flex the throttle too much, which demands a feather-touch to keep the car in EV mode (below 32mph normally), and the engine switches in seamlessly. I have no issue with the operational aspects. 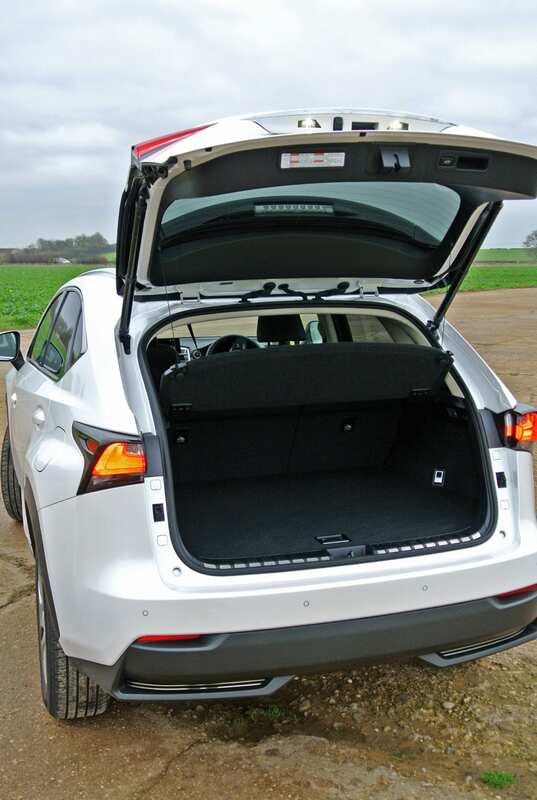 Even running about in EV mode, which is possible for upwards of a mile at a time (and you can watch the battery consuming its capacity on-screen), the car is a delight, which also leads to its excellent in-town performance. However, any frugality expectations are lost as soon as the speed increases above 45mph. 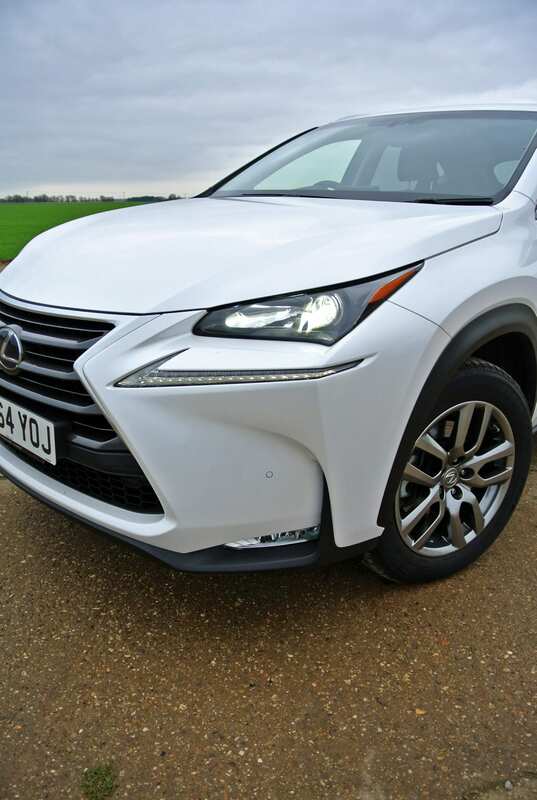 Therefore, unless you are engaged by its other worthy qualities, I cannot recommend the acquisition of an NX300h, if you think that hybrid should also mean lower running costs overall. Conclusions: Lexus has produced a most attractive, muscular, urban SUV that will meet expectations on the premium luxury front. Sadly, it does not satisfy on the frugality chart. True. It is excellent in urban environments but, take a drive into the countryside and its fuel economy plummets most unsatisfactorily. As a result, the NX300h makes no sense, unless you only wish to trawl around town in fully-charged EV mode, a mile (or so) at a time. It is a real pity, because the car is otherwise very good. « Troubled Virgin Flight VS43 flies over my house!